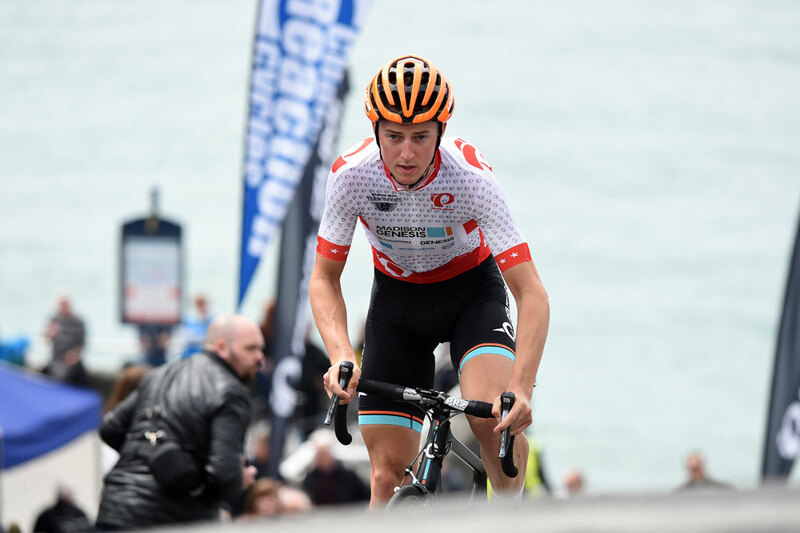 George Harper gave One Pro Cycling a victory in the Tour Series hill climb, the opening part of the third round of the nationwide series in Aberystwyth on Friday, May 22. Harper powered up the gruelling course around Constitution Hill to beat Jonathan McEvoy (NFTO) by just over two seconds, with Tom Stewart (Madison-Genesis) completing the podium in third. One Pro Cycling also took the team award for the event, with the squad’s Jon Mould and Chris Opie placing sixth and 12th respectively. Ed Clancy (JLT Condor) won the evening criterium around Aberystwyth, with Stewart continuing his good day with second place and Mould placing third. Madison Genesis topped the team table for the round, and also lead the overall standings after round three, just two points ahead of close rivals One Pro Cycling. Pedal Heaven are third. Round four of the Tour Series will take place in Motherwell on Tuesday, May 26, with round five in Durham on Thursday, May 28. The 10-round series concludes in the Georgian city of Bath on Thursday, June 11. Television highlights of the Aberystwyth round will be aired on ITV4 on Monday May 25 at 9pm, with a repeat at 8am on Tuesday May 26.